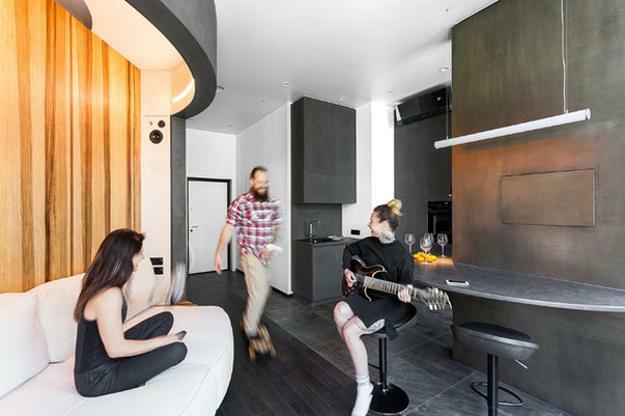 A small bedroom design which rotates turning into a living room is an original idea improving the functionality of the small apartment in Moscow. 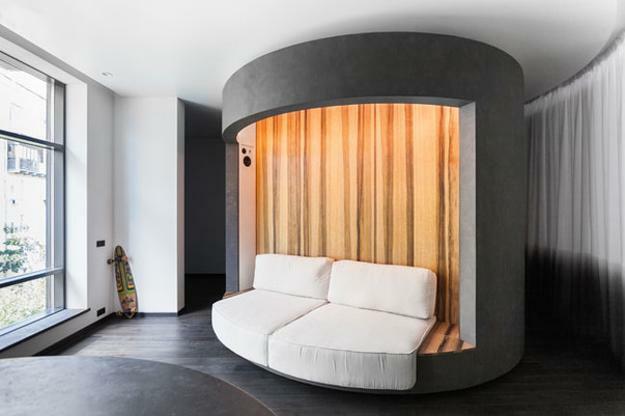 The rotating room divider in the Art residence flat is the anchor for a bed and a living room sofa. 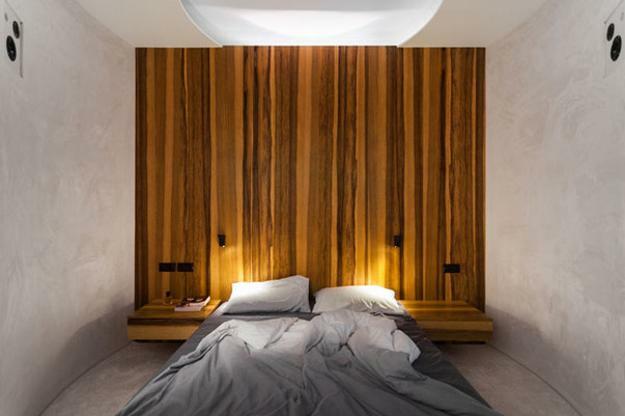 The small spaces with the rotating rooms maximize the interior design in the minimalist style. 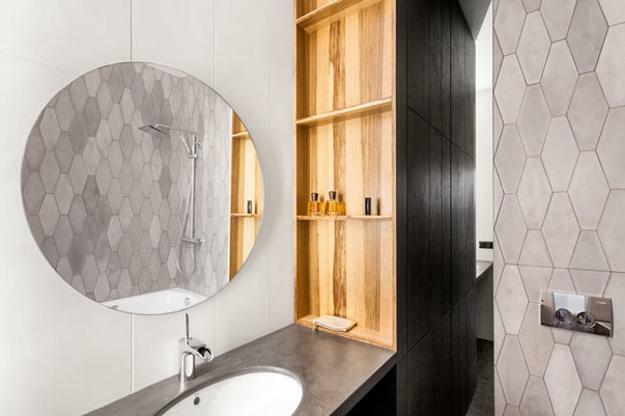 The apartment ideas are stylish and contemporary turning a concrete space into functional, modern home interiors with a touch of futuristic urban design. Russian architect Maryana Vecher envisioned the modern interior design and transformed an old space. The innovative apartment ideas include the rotating bedroom design, space-saving living room sofa fixed to the rotating wall, functional kitchen with a small island, plenty of storage, and home office. The interior design transforms with the rotating wall, offering tens of different positions and various room looks. Modern kitchen furniture offers plenty of storage and ergonomic design. A small bathroom features storage shelves which can be repositioned creating various arrangements and choosing the best storage ideas. Even the concrete wall design is flexible allowing some adjustments. 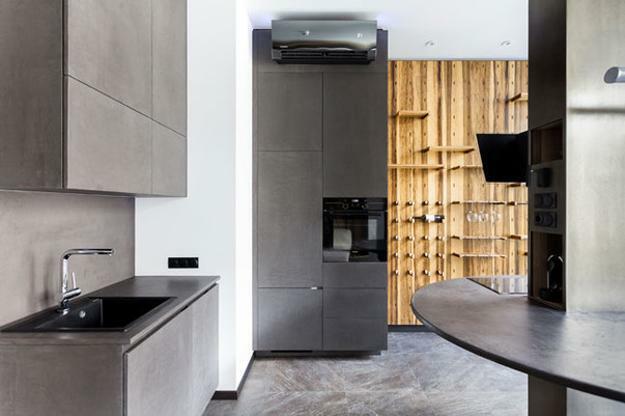 There are wall panels with modular elements, shelves, bars, racks, and hooks which will enable to change the wall design and modify the storage arrangements by an owner taste. 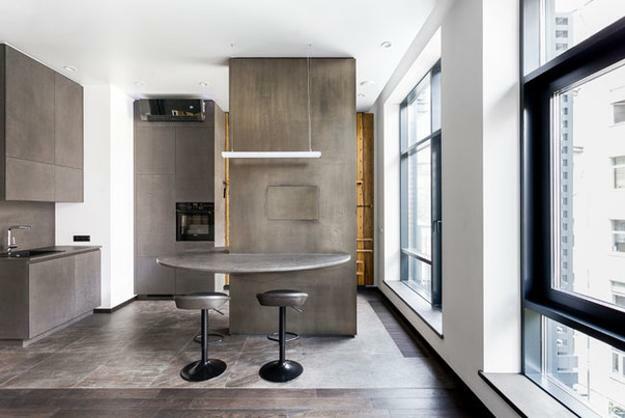 Custom furniture design and original decor accessories enhance the unique look of the concrete interior. Dark gray color tones and wood work well with modern lighting fixtures creating the exciting, contemporary interior design. The lighting and neutral colors allow experimenting with various ideas and change the mood in the rooms.